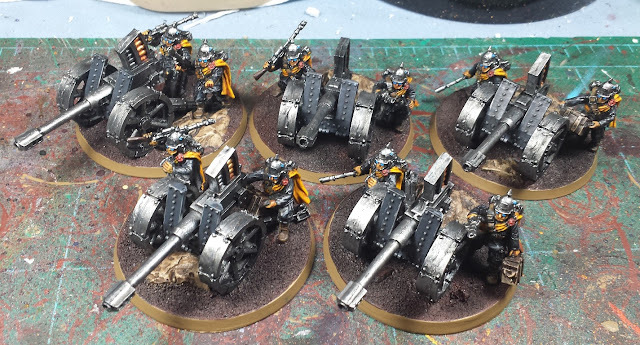 Cracking along with the Geno Five-Two, feeling like I have the paint scheme dialed in pretty well at this point, and was able to bang out the Autocannon heavy weapon teams over the last couple nights. Really been nice getting back into the swing of painting once again! Still waiting for it to warm up enough to do the initial sealant pass and get the static grass on. Up to 45F tomorrow they say, but that's still well into what I consider the danger zone for spray sealant. Better to wait for warmer days than risk 'em frosting over, I think... In other news, the long-awaited heads finally arrived after being lost in the warp for weeks. Time to crack out the greenstuff and get the rest of the infantry re-capitated! Once that's done, all the infantry will be built, which means at this point the only thing I'm still missing are the three Leman Russ tanks I have planned for the army. In Legion, while they mention the Geno had tank support, other than the Centaur there isn't a specific name/variant mentioned, so just to be a little different I'm thinking about going with the MaxMini Gothic KV-2, as I quite dig the quasi-Ragnarok look which I think suits the Heresy vibe of the army. I'll likely leave off the side sponsons and swap out the hull weapon for a proper lascannon. Gotta wait to rebuild the hobby fund a bit first - too much coming in and not enough going out of late! The yellow goes off so well against the darker colours. And the heads are such a classic throw back against the old rogue trade figures. Love the blue lenses. I agree. I love this look! and yay for those Gothic KV-2's. Very groovy tanks. I have had that KV2 on my wish list for so long. It is my favourite tank to play in World of Tanks as is. It will really suit the army theme you are putting together as well, looking forward to seeing you get to grips with one. Are you going to hang on to these bad boys, matey? Nice ideas for the tanks. Misfortunately, I've just set aside a load of las cannons for some new counts-as-vendettas, otherwise, I'd post 'em over. @Frothing Muppet: Thanks man! Quite happy with the heads too, definitely hearkens back to the RT-era plastic guardsmen. @Rory Priest: Me too! Been eyeballing it since they debuted and have been looking for an excuse to give 'em a go! @Zzzzzz: No worries man, the Closet of Doom shall provide! Hah! @NafNaf: Thanks very much - hoping they all tie together thematically when the dust settles! KV2! And Grimdark'd and everything! Love it. Those cannon crew are just great. This project has been a good one to follow so far. @Dai: Indeed - As absurdly grimdark-ified as it is, I gotta say I love it! Should be a hoot to build and paint. Thanks very much!